620gsm 100% microcotton loop terry. This uniquely plush, luxuriously soft and wonderfully absorbent king size beach/bath towel has a decorative dobby border and a dobby hem. WHITE. Product Size: 1676Wx889H mm. Print/Embroidery. Size: 1150Wx660H mm (Print). 300gsm 100% cotton, triple sheared terry velour. This palm tree designed beach towel has a velvety velour feel. Smooth sheared finish and fibre reactive printing provide vibrant detail and colour for this palm tree stock beach towel. Custom design available (MOQ: 1000) POA. PALM TREE. Product Size: 1524Wx762H mm. Print/Embroidery. Size: 380Wx380H mm (Print). 360gsm 100% cotton terry velour. This velvety velour beach towel is fibre reactive printed in a hip leopard pattern. The high quality sheared surface is perfect for embroidery. LEOPARD. Product Size: 1524x762 mm. Embroidery. 360gsm 100% cotton terry velour. This velvety velour beach towel is fibre reactive printed in a hip zebra pattern. The high quality sheared surface is perfect for embroidery. ZEBRA. Product Size: 1524x762 mm. Embroidery. 240gsm 100% microfibre polyester. This super soft microfibre velour towel is great for edge to edge sublimation printing of company or event logos. Triple sheared on both sides to eliminate scratchy feel inherent to microfibre towels. Four colour process images printed with brilliant colours. SUBLIMATION. Product Size: 558Wx381H mm. Sublimation. Size: 558Wx381H mm (Sublimation). 440gsm 100% cotton triple sheared terry velour. This fitness towel can be embroidered or printed for your promotional needs. RED, AQUA, YELLOW, WHITE, BLACK. Product Size: 1118Wx305H mm. Print/Embroidery. Size: 381Wx175H mm (Print). 500gsm 100% cotton triple sheared terry velour. Top of the line, heavy weight, dobby hemmed hand & sports towel. BLACK, HUNTER, LIME, RED, YELLOW, SKY BLUE, PURPLE, LIGHT PINK, HOT PINK, BEIGE, AQUA, GOLD, LIGHT BLUE, ORANGE, SILVER, ROYAL, NAVY, LAVENDER, BURGUNDY, WHITE. Product Size: 660Wx 406H mm. Print/Embroidery. Size: 381Wx304H mm (Print). Luxurious 600 gm2 cotton bath towel in vibrant new colours. Ideal for gifts, rewards programs, incentives and the home. Can be printed or embroidered Refer to customer service for additional colour print information Materials: 100% cotton terry. Item Size: 68x137cm. Packaging: 6 per poly bag. Colours: Purple | Mocha | Charcoal | Red | White | Black | Pink | Grey | Lime | Turquoise. Decoration Options Available: Print | Embroidery. 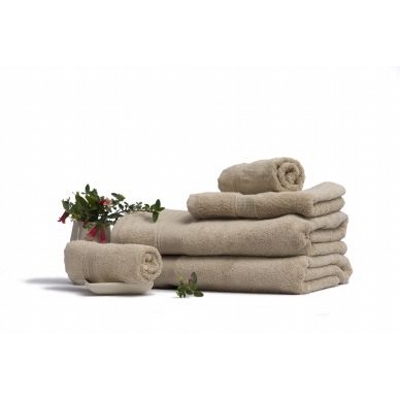 Elite - Plain terry Bath towels 68x137cm, 500 gm2. 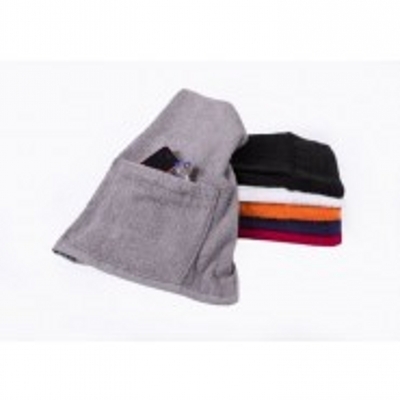 These towels are perfect for the GYM, GOLF CLUB spa or resort. Add an embroidery, print or photo decoration Refer to customer service for additional colour print information Materials: 100% cotton terry. Item Size: 68 x 137cm. Packaging: 5 per poly bag. Colours: Black | Navy | Red | Chocolate | Royal | Hunter Green | Burgundy | Lincoln green | Sky Blue | Grapite | Steel Grey | White. Decoration Options Available: Embroidery. 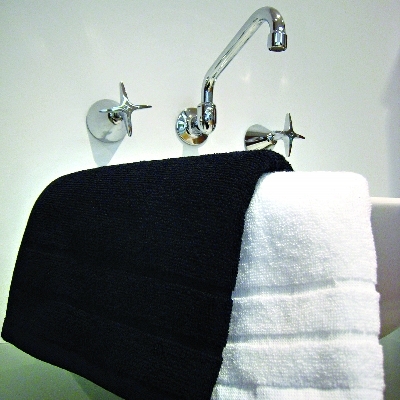 Excel Salon towels - Plain terry salon towels. Vat dyed and bleach resistant. These towels are perfect for the salon or gym. Add an embroidery or Photo Materials: 100% cotton terry. Item Size: 37 x 75cm. Packaging: 10 per poly bag. Colours: White | black. Decoration Options Available: Embroidery. 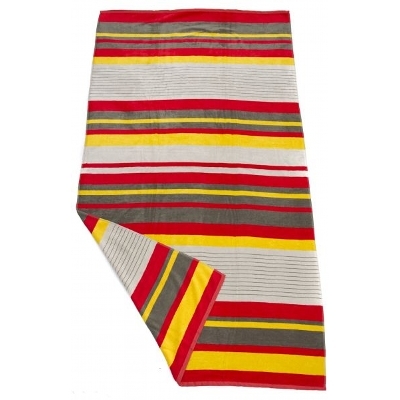 Florida Stripe Beach Towel - Gorgeous velour beach towel in 2 colours. 86x160cm, 420gm2. Perfect for Embroidery, Print or Photo Decoration. Please refer to supplier for more printed prices and images. Materials: 100% cotton velour. Item Size: 86 X 160cm. Packaging: single poly bag. Colours: Aqua/white | Pink/white | Black/white | Lime/white | Navy/white | Red/white | Yellow/white | Royal/white | Orange/ white. Decoration Options Available: Print | Photo | Embroidery. Decoration Areas: 70 x 90cm. Soft Luxurious Egyptian Cotton Bath Sheet, 600 gm2. Coordinating Bath Towel, Hand Towel, Face Washer and Bath Mat also available. Materials: 100% Egyptian cotton terry. Item Size: 80 x 160cm. Packaging: 2 per poly bag. Colours: Denim | Ash Green | Ivory | Oatmeal | Mocha | Linen | Steel Grey | White. 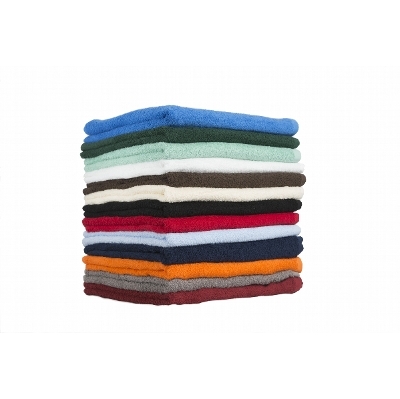 Rich Thick Cotton Towels, 800 gm2. Coordinating Bath Sheet, Bath Towel, Face Washer and Bath Mat available. Materials: 100% Cotton. Item Size: 40 x 70cm. Packaging: 10 per poly bag. Colours: Oatmeal | Chocolate | White | Charcoal | Linen | Grey. 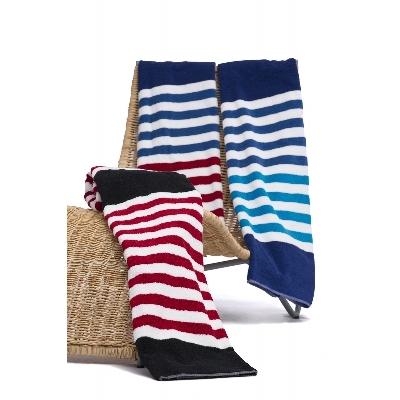 Seaside stripe - contemprary horizontal striped beach towel 86x160cm, 550gm2. Materials: 100% cotton terry. Item Size: 86 x160cm. Packaging: single poly bag. Colours: Aqua | navy | red | fuscia | orange | purple | royal | black | white | lime | yellow. Decoration Options Available: Embroidery | Photo. Decoration Areas: 860 W x 160mm H.
Extra Large striped Velour Jacquard Beach towel in 2 bright colour ways. 100 x 180cm 430gm2 Perfect for Embroidery or Photo Materials: 100% cotton velour. Item Size: 100 x 180cm. Packaging: single poly bag. Colours: Ocean | Sunshine. Decoration Options Available: Embroidery | Photo. Havana Striped Velour Beach towel in 9 bright colour ways.450gm2 Perfect for Embroidery, Print or Photo Materials: 100% cotton velour. Item Size: 75 x 150cm. Packaging: single poly bag. Colours: Aqua/white | Hot Pink/white | Black/white | Lime/white | Navy/white | Red/white | Yellow/white | Royal/white | Orange/ White | Green/white. Decoration Options Available: Print | Photo | Embroidery. Decoration Areas: 70mm x 90mm. 325gsm 100% cotton terry velour. Hemmed lightweight golf towel. Corner grommet and hook. White, Orange, Gray, Red, Navy, Royal, Hunter Green, Black. Product Size: 381x609 mm. Print/Embroidery different price column on white and colours. Size: 304x406 mm. 390gsm 100% cotton terry velour. 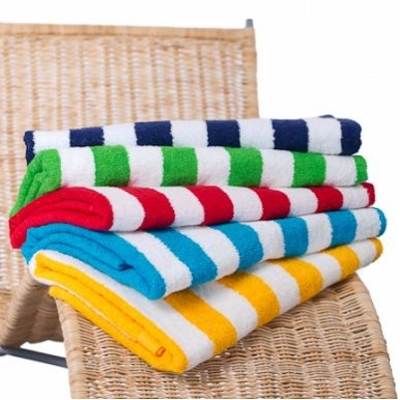 Twill hemmed midweight beach towel. Available in white only. White. Product Size: 889x1524 mm. Print/Embroidery. Size: 635x1270 mm.